Iris Apfel: The 96-year-old fashion icon with more hutzpah than an arena full of Gen-Z entrepreneurs. This "geriatric starlet"—as she so comically calls herself—is adored throughout the industry for her flamboyance and quick wit. 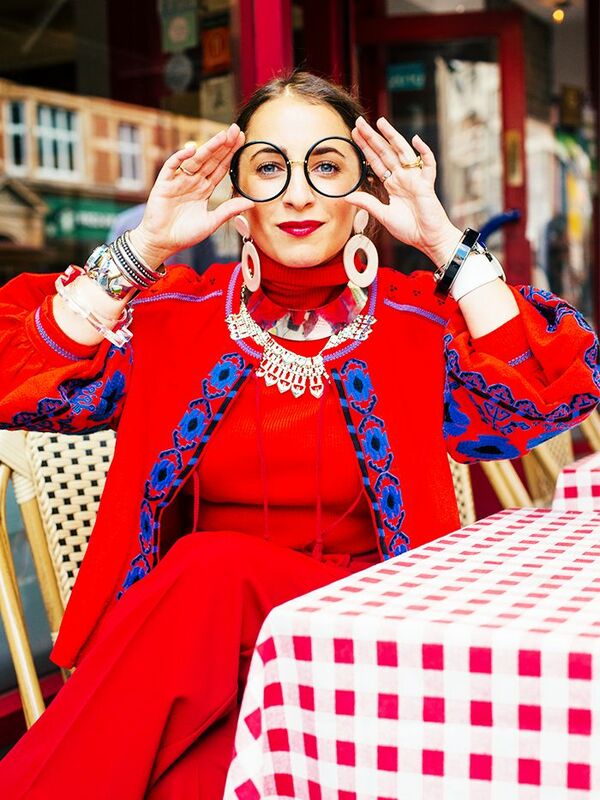 No one provides a sound-bite quite like her, but there are also few who so confidently wear colour, can pile on jewellery and have the ability to shop high, low, anywhere and everywhere, seeking out something special and emotive no matter its origin, price point or supposed trendiness. You probably know the essentials about Iris: She's based in New York; she wears thick, instantly recognisable black circular porthole-style glasses, but her moment in the spotlight really began only around a decade ago when the Metropolitan Museum of Art in New York chose to exhibit a selection of her personal fashion collection and the book Rare Bird of Fashion was released. She's the ultimate in irreverence and has lived an interesting life indeed—so for everything that you ever wanted to know about the American icon, we've compiled a handy guide. Keep reading to learn more about Iris Apfel. Where is Iris actually from? If Iris seems like a New Yorker through and through, that's because she is. Born in Queens on August 29, 1921, Iris has since changed postcodes, but she has remained in the city: She now resides in a three-bedroom Manhattan apartment that's chock-full of European antiques she's collected on her travels, clashing fabrics, eclectic artwork and racks and racks of her extensive clothing and accessory collections. Architectural Digest's peek inside her home is nothing short of fascinating. While many of you will consider Iris's chief occupation to be a fashion icon, her original creative life actually started within the realm of interior design. First she apprenticed for interior designer Elinor Johnson. The tastemaker—with her trusted eye for an exotic vintage find and who originally studied art history—has since worked with the wives of nine presidents of the United States to decorate the White House, and in 1950, she co-founded the fabric company Old World Weavers alongside her now-late husband, Carl Apfel. The company was introduced to create a range of interior fabrics to keep up with the demand Iris was experiencing for the rare, antique bolts she would find in Europe and North Africa. Iris is a self-confessed "fabric freak," which would explain not only Weavers' unusual creations but her textural closet too. The business was sold in 1992 to Stark Carpet. Iris's early fashion career starting at the legendary industry title Womens Wear Daily as a copy editor, but since her rise to fashion fame, Iris has launched a handbag brand called Extinctions, been a campaign girl for Kate Spade New York, launched a makeup collection with MAC, found time to be a visiting professor at University of Texas as well as consulting and lecturing on fashion and style across the globe. Her next project? A jewellery collaboration with Swarovski, of course. Iris is quick-witted and notoriously candid. From the motivational "it's better to be happy than to be well-dressed" to the acutely observant "people with a lot of money don't dress as well as people who have to make do, who have to be inventive," you can bet your bottom dollar that Iris is never short of something to say. 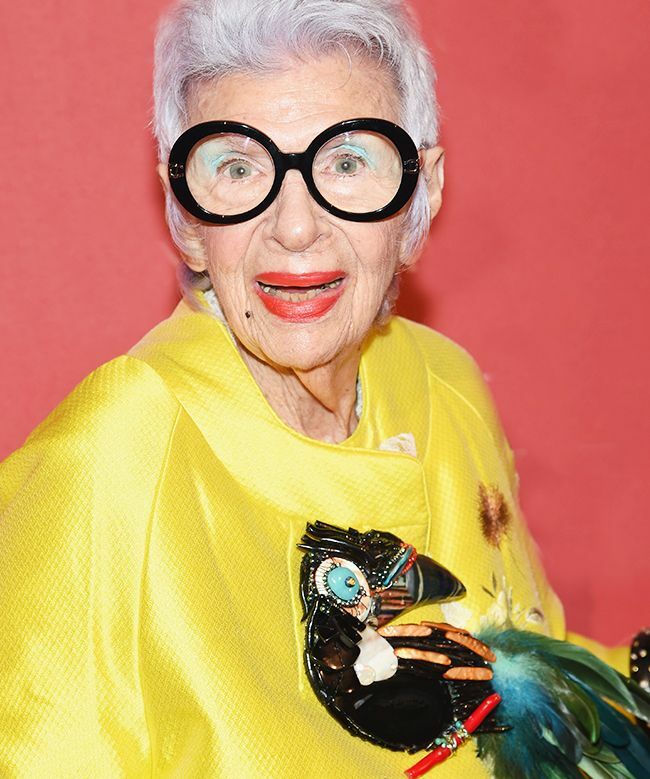 From her smart remarks peppered throughout the Albert Maysles documentary, Iris, through to guest appearances on the Home Shopping Network or in-store events, Apfel knows exactly how to hold everyone's attention. See all of Iris Apfel's best quotes here. Iris had a lot to say about jeans when talking to Architectural Digest in 2011: "Have you seen the prices? Scandalous. I mean, yes, if they are embroidered or beaded or made special in some divine way, but honestly, jeans are jeans. I live in them most of the time, but I had a helluva time getting a pair of jeans around 1940, when I was at the University of Wisconsin. I thought I'd wear jeans, a turban, and some old earrings. So I went to an Army-Navy store, but you have to remember, back in those days, all the men in Wisconsin were the size of Paul Bunyan. Then the salesman told me, 'young ladies don't wear jeans.' He wouldn't sell me any or have them cut down. So I kept going back to the store, and they kept throwing me out, so to get rid of me, they finally ordered me some boys' jeans. I love men's jeans; they fit me better." Where can I see Iris's collection now? Although there are no official exhibitions at the moment (the last one was at Le Bon Marché in Paris in 2016), the story goes that Iris has donated 600 pieces from her enormous back catalogue to the Peabody Essex Museum in Salem, Massachusetts. Why there? Apparently, Iris was so impressed by the local museum when her Rare Bird exhibit toured the country that she started donating about 90 pieces per year to them. The amassed range includes divine designer pieces from Lanvin, Dior and Alexander McQueen amongst many others. We all know Iris wears her black opticals on repeat, but before you think her wardrobe is entirely made of colour, we have witnessed many occasions where the style star chooses black instead. She, of course, has a range of jet-black jewellery to throw on, but when it comes to wearing darker clothes, her outlook revolves around texture, texture and more texture. Think embroidery, Mongolian lambswool, beading, fluff, leather and more. Who is in her circle? Anyone who has watched her eponymous documentary can attest to the close bond between Iris and her late husband. She has been very open about not having children ("I didn't have children, but I never wanted children. You can't have everything and I knew I wanted a career…") and surrounds herself with some of the coolest and kindest names in fashion. Pictured here is a long-time collaborator, Linda Fargo, Bergdorf Goodman's senior VP, while designers such as Duro Olowu are lucky enough to go shopping with Iris in NYC (this video of them both at London Zoo is priceless). The legendary, late street style photographer Bill Cunningham was always a fan of Iris's style, Marc Jacobs has been inspired by her, and she became firm friends with Bruce Weber after he photographed her for Vogue Italia in 2007. Where does she buy her glasses? Sad news for anyone looking to scoop up a pair right away, Iris revealed to The Coveteur that she found her signature glasses at a flea market: "I started to wear them when I needed to wear glasses! As a matter of fact, I liked them so much—the great big ones—sometimes I'd wear them without any lenses, just as an accessory, as I thought they were so fantastic." Iris did work on an eyewear collaboration with Eyebobs in 2011, but the closest options you'll currently find are from a Swedish brand Efva Attling—they have some frames dedicated to the icon and aptly called the Iris. Next up, the best high-street dresses known to man.